The following little article had me going for a moment. 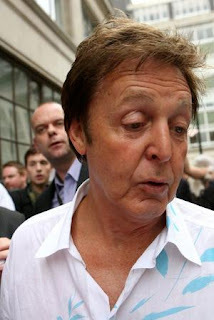 It said that Sir Paul Mccartney was going to promote Pete's coffee. I thought it was referring to that little commercialized chain Peets that is trying to mimic Starbucks. Actually he is promoting his long time friends shop. I don't have any idea as to what Sir Paul McCartney's current favorite brand of coffee is or if he even drinks coffee at all. I wish I could get him to sing a Mr. English Coffee song. Maybe something like: "Mista Mista didn't mean ta miss ya... Drinkin' on the road without you... is like swillin' down crude oil goo". Well, maybe I'll leave the song writing to Sir McCartney and I'll stick to the roasting but it really we would be bloody nice and beautiful if he would someday consider writing and performing a song for Mr. English Coffee Roasting co. There are ever so many famous and great musicians these days in the world. More so than at any other time in history (I'm just referring to musicians not composers). None of them can really match the sheer talent, though, of Sir Paul McCartney, in my opinion. I remember watching him once on a Saturday Night Live performance where they had a video of him playing something like nine different instruments and then they had it all mixed into one not only good song but a great song and perfomance. For each instrument Sir McCartney had dressed up in a different costume and the video did indeed look like an authentic semi big band performance. If I'm not mistaken he really did play all of those instruments as well not just mimicking as many amateurs do. Later on as years went buy it became common place to have actors playing various roles in movies such as Mike myers in Austin Powers not to mention numerous others. But when Sir McCartney did it, it was truly unique and original in its time. I wonder if it was his original idea or that of the producer. In any case he is a person of extreme talent and greatness and that is why he is now know as Sir Paul McCartney by the Queen of England her royal majesty. SIR PAUL MCCARTNEY is to appear in a new five-minute promotional film to promote former The Beatles band-mate Pete Best's Liverpool, England coffee shop. The drummer now owns the city's legendary Casbah Coffee Club, where the Fab Four once hung out before they became superstars. The venue, which was recently named a historic building by the English Heritage, was once housed in Best's childhood home. MCCartney admits he was thrilled to be asked to take part in the publicity campaign: "I think it's a good idea to let people know about the Casbah. They know about the Cavern, they know about some of those things, but the Casbah was the place where all that started." The Quarrymen, featuring John Lennon, George Harrison and MCCartney, performed at the opening night of the Casbah on 29 August, 1959. The commercial, which also features an appearance by John Lennon's first wife Cynthia Lennon, will premiere on Friday (11May07) in and around Liverpool.